Parallel process for rendering with sampling-based integrators. Splits an image into independent rectangular pixel regions, which are then rendered in parallel. 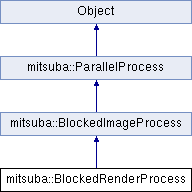 Bind a resource to this parallel process. Takes a resource ID as given by the scheduler and associates it with a name. This name can later be used by the work processor to access the resource data. Create an instance of the algorithm responsible for executing the work units of this parallel process. Called whenever a work unit has been completed. Note that this function may concurrently be executed by multiple threads. Also, processing of work results will generally be out of order with respect to the creation in generateWork(). When a work unit is only partially completed due to a call to Scheduler::cancel(), the second parameter is set to true. A thrown exception will lead to the termination of the parallel process. Set the pixel format associated with the rendering process. By default, this class works with image blocks that store a set of spectral samples along with an alpha value and an accumulated reconstruction filter weight for each pixel. This method can be used to change this, which is useful when additional information should be returned (e.g. normals or depth values). warnInvalid By default, the rendering process issues a warning when writing negative, infinite or NaN-valued pixels. This flag can be used to turn off the warnings.